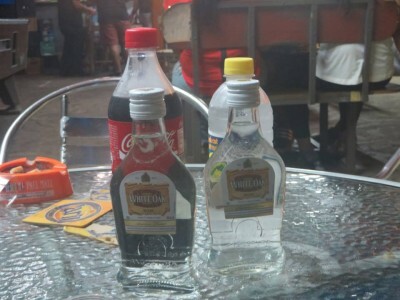 Is your mouth watering from my previous blog about Trinidad and Tobago, yet? Well, there’s more where that came from – shark’n’bake anyone? Check out what we actually did in T&T instead of what I just ate. Trust me, it’s a fun, fun place to be! We arrived home to “the farm” in the late afternoon and I met the numerous cats, dogs, ducks, chickens, geese and pigs wandering in and around the open-air house (note: most homes in Trinidad are open-air at least to some extent because year-round, whole-home, air-conditioning in this humid island climate can be quite expensive) surrounded by mango trees, banana trees, a stream and two separate vegetable gardens. Sean’s younger sister Chervon and her boyfriend Michael greeted us at the door, and soon after his stepfather Louie came home from work, as well. I can say in all honesty, from minute one I was welcomed with open arms by his whole family, and for that I couldn’t be more grateful. The hospitality shown by them all was wonderful, and such a refreshing change from the sometimes standoff-ish style in America. If you couldn’t tell already, family and friends are a big, big thing down there, and I think that’s awesome. Time with loved ones is given significant weight (i.e. work to live, don’t live to work) and I think it’s something the US should take more seriously. I wasn’t joking about the hospitality. It was second to none. Our first night was relatively low-key as we’d been travelling since early that morning, but even so, I got my first induction to T&T during the rainy season (rainy as in: for six months out of the year it sprinkles for an hour or so each day then clears up). We had a rain shower in the late afternoon, and I met the mosquitoes of Trinidad. Normally I’m a mosquito magnet at home in the United States. True to form, in Trinidad I was irresistible and unfortunately for me the mosquitoes are bigger, more vicious and infinitely more plentiful. When I say bigger, I mean it – mosquitoes in T&T appear to be close to the size of compact cars – they’re that large. Even with rotating fans, mosquito repellant, mosquito candles and long pants, I was still on the losing end of a battle with the bugs. Wherever I neglected to spray (like my feet or hands) was fair game. One thing that Trinidad does have that the US needs to get, in my opinion, are these awesome bug zapper tennis rackets, not only do they allow you to zap pesky mosquitoes into oblivion mid-air, but they also make a satisfyingly loud ZAP every time another one bites the dust. The trouble makers for the evening. The following day, we went to Maracas Beach, probably the most popular beach in all of Trinidad that’s in the north of the island about an hour’s drive from the Bush. It worked out beautifully because a good friend of Sean’s, Sateesh, had a bunch of family visiting from the States and was taking them all to Maracas that day as well. Perfect! Sean, Chervon, Michael, Ethan and I piled into the car loaded with towels, sunscreen, coolers of drinks, snacks, extra clothes and liquor (of course), and headed out. 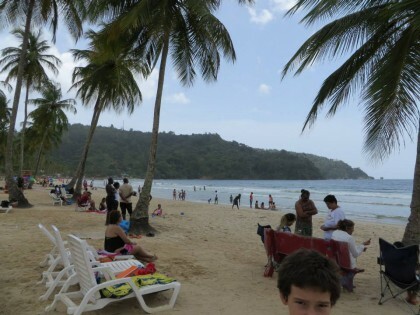 Maracas Beach is truly a great, if touristy, representation of Trinidad’s beaches: it is all soft sand, coconut trees, people hawking everything from shell bracelets, to mango chow, to cotton candy, strong but not overwhelming waves, and shark and bake, namely: Richard’s Shark and Bake. While Sean caught up his friends Sat, Andrew and Doug, Ethan and I took full advantage of the ocean, spending the majority of the afternoon in the water. Finally in the late afternoon, we migrated over to Richard’s for a famous shark and bake sandwich (delicious and huge), and then packed up, tired and sandy (and only slightly sunburnt) to head home. 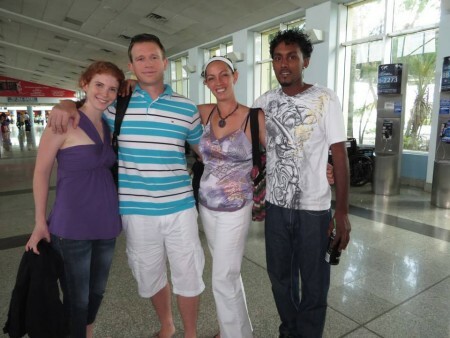 It was excellent – and probably the most white people I saw in one place the whole time we were in T&T. Side note: White people make up only 0.7% of Trinidad’s 1.3 million population. It’s like spotting a rare and mystical unicorns on the island. 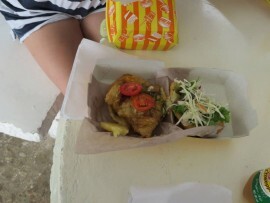 The only appropriate food to eat at Maracas: Richard’s shark and bake! And luckily, it’s delicious! On Monday, Sean, his mom and I went south to the city of San Fernando, and I got to see exactly where he grew up and his grandparents lived, his friends’ houses, his school (St. Benedict’s), the numerous spots where he got into scrapes or broke bones, and heard the stories that only come to mind about growing up when you’re back in the place where it happened. For lunch, we went to his favorite Chinese restaurant, Nam Fong for char su kai fan, then made a quick stop to a large supermarket (which are not on every corner like Publix and Krogers are here) for supplies before going “down the islands” the next day. What is “down the islands” you ask? I guess you’ll just have to read the next blog to find out. To give you a hint though, it’s probably one of my favorite parts of the whole trip. Stick around! This entry was posted in Caribbean, North America and tagged Beach, Caribbean, Maracas, Mosquito, North America, Rum, Shark and Bake, Tobago, Travels, Trinidad, Trinidad and Tobago on June 11, 2014 by Paige N..